© 2016 by Tristina Wright. The day the dragons came, Neal kissed a boy. This span of months would later be remembered as the Awakening and condensed to precisely three pages in a tenth-cycle history text. Those three pages would lie nestled between twelve pages on the War of the Sea (when the merfolk rose up and attacked the trade ships in retaliation for an attack against their king) and twenty-four pages on the Reconstruction Age (when what was left of humanity tunneled deep into the earth in order to survive after the dragons scorched the sky). Both the War of the Sea and the Reconstruction Age were very fine events on their own—filled with lots of history and quite a few legends—but the Awakening was something else entirely. Those three pages in a history text would never mention Neal. History texts never wrote about boys with brown skin and ordinary blood. They wrote of boys with porcelain skin and blue blood. They would also never write about Killian, even though, in Neal’s low-status opinion, they should. Killian with his lips on Neal’s as thousands of dragons clawed their way to the surface of the world, as if the core was never molten rock but a ball of dragons warming the planet from within. The dragons roared, and Killian smiled against Neal’s mouth. In all his eighteen years alive on this little world, Neal had never seen anything more beautiful or more terrifying. “You came back,” Neal said, the words tumbling out and slurring together with giddiness. “I want to keep you,” Killian whispered as he ran his nose over Neal’s cheekbone and rubbed his lips against the curve of Neal’s jaw. Neal’s back scraped against the wall, his shirt catching on the crumbling brick covered in fading neon paint that proclaimed salvation for the damned. The sky glowed orange and red and the gold of Killian’s eyes. It was breathtaking even as fire rained down from the throats of dragons like vengeful angels come to kickstart the apocalypse. Deme, the City of the Dragon Son, burned as had been foretold in whispered warnings for a century. Deme with its metal and stone buildings scraping the clouds. Deme with its stores of wealth in the sky, with the airships that fought the dragons while people either scattered or accepted their fate. “I almost didn’t want you to come back to me,” Neal said, swallowing his nerves and grasping at Killian for fear he’d disappear in a burst of flame. “I promised I would come back for you,” Killian said against Neal’s throat. When Neal was fifteen, he met the boy with golden eyes. Every day for the previous five years without fail and in spite of weather, hunger, or injury, Neal had ferried messages all over the metropolis of Deme in exchange for ration credits. He’d walked through the golden gates which separated the rich from the poor, clutching fragile packages for women covered in powder and jewels. He’d scurried through the different markets, his stomach growling at the street carts. He’d dodged pickpockets and police. He’d listened to old men swap stories of dragons and sirens as they drank homemade liquor from battered tin cups. He’d accepted tips in food scraps, worthless chipped coins, and the occasional riddle. At least most of the populace tried for a tip. The long-robed Dragon worshippers who perched on every street corner had shoved their parchment pamphlets in his face as he tried to scurry by with deliveries. Dragon forbid he had to actually give one of them a message. Their idea of a tip was to tell him he was headed to the belly of the underworld. In Deme, the Dragon worshipers built their golden temples and congregated weekly. They gave sermons on how the dragons pushed the cities from the earth to give wayward humanity a home. They condemned riches and waste (something Neal didn’t understand given the magnificence of their holy places). Condemned the treatment of the poor (something Neal agreed with), and the airships sullenly shouldering through the clouds (something Neal didn’t agree with). Most days, he’d avoided eye contact and their rotten pamphlets. Siren Mother worshippers were only a little better. Relegated to the docks and pebbled beaches, they preached against the dragons and warned the ocean would rise and swallow all of mankind. That the sirens of the deep weren’t truly defeated in the War of the Sea. That they simply waited for their moment. Neal had always smiled his own private, knowing smile at that, his skin prickling pleasantly any time they shouted about the ocean deep and the monsters which lived there. As he had thrown the useless coins in the massive Dragon Fountain located on the eastern side of the city, he’d sung the familiar prayer under his breath, his thin boot soles slapping the uneven cobbles on the way to his next client. It was a child’s nursery rhyme, taught to every youngling alongside letters and numbers and the Ages of Time. Neal had learned at least that much before his father perished in the War of the Sea—when the merfolk rose out of the depths and attacked human ships—thus making Neal the man of the house. At ten years of age, he’d walked out of his home next to the pull of the sea and into the ration office, his quickness and litheness earning him a spot as a messenger and three rations a week. His life had become a monotony at ten and continued in kind for the next five years. Neal had muttered a new riddle to himself over and over with the rhythm of his stride until he had it memorized, ignoring the smears of color and light as he traversed the same maze of streets again and again and again. Messages never ceased. Things that rattled. Things that rustled. Things that smelled. Things that leaked. Things that broke. Things and letters. Letters and things. He’d dodged a cart covered in more rust than metal and held together with twine and prayers. Dodged a motorbike which belched purple smoke and glowed from within as if it were living. Dodged a pack animal with four eyes and six horns and feet as large as his head. He’d slowed as he neared the Dragon statue in the center of the city. Twenty feet high and made of polished gold-veined marble and inlaid with rubies, it was as beautiful as it was a reminder of how little the leaders of Deme cared for its citizens. Pieces of that statue would feed the people in the lower slums for months. But worship of the Dragon and Dragon Son was paramount. Deme was a shining example of sacrificial devoutness with its statues and starvation. “It’s a little much,” said a voice to his right. “I think we should tear down the statue,” Killian had said with as much nonchalance as one would use discussing the weather or the catch of the day. “You can read minds?” Neal had blurted before he realized his error. Ice flooded his veins and he’d stumbled back a step. Killian’s hand had closed around Neal’s arm, and he’d pulled him closer. “I’m not here to hurt you, Neal,” Killian had said softly, his voice rolling across Neal’s bones and settling in his hips with an enticing warmth Neal wanted to fall into. “Of course he’s real. The dragons keep us safe on land just as the merfolk keep us safe on water,” Neal had mumbled even while his insides beat out a steady rhythm of you. don’t. believe. that. “The dragons built the cities and the sirens helped populate the land. We keep the land cared for and, in turn, they protect us.” Never mind that, despite the teachings that’d rolled off Neal’s tongue like a good little student, he knew humans had gotten the world drunk and ravaged her without consequence. “I don’t know you,” Neal had said. “Do you want to?” Killian had asked. His eyes had widened for a heartbeat and he’d shifted his weight. He’d shoved his hands in his pockets and curled his shoulders inward and suddenly looked very small. Neal had nodded, somewhat unsure as to why and yet . . .
Twelve hours later on the rocky shores of the blue-black ocean, Killian kissed Neal on the cheek and told him he was beautiful. Neal hadn’t known how to react to the declaration beyond blushing as red as Killian’s hair. His insides were a mass of writhing snakes as he’d stared at Killian’s face. He’d worn his emotions plain on his face and in the long lines of his body, and Neal had wondered if this was how love happened. His mother had always told him it only took a look between her and his father (Dragon Son rest him). There’d been at least twenty-seven looks between himself and Killian. Maybe that was love—a glance and a whisper of maybe. “I have to go,” Killian had said suddenly, his eyes on the sun as it melted into the horizon. The sun slid away and the sky became a bruise. Killian had smiled and held out his hand, palm up. Neal had tangled his fingers with Killian’s and they headed back to the city. Ninety minutes after that, they’d stood in the ruin that was once the Dragon statue, breathing hard and blood singing with elation. Neal had curled his fingers in Killian’s shirt and pulled him in for a kiss. It was a little messy, a little inexpert, a little enthusiastic, but Killian had returned it, and that’s all that mattered. Neal had hated anyone seeing him naked because of the secrets across his skin. Killian had understood and was gone the next morning. Exactly twelve months later, Killian had reappeared next to the new, larger Dragon statue. Twelve hours later, he and Neal had pulled it down again, breaking it into pieces small enough for children to carry away in the night. “Do you have to go?” Neal had asked later that night, his lips pressed to Killian’s. “When?” Neal had murmured, not wanting to damage this moment with the volume of his voice. The city never put up another statue. “Killian,” a low voice rumbled somewhere to their left. The dragon was green with golden tinges to its scales. The green stood out as harsh as a lightning bolt, and as glittering as the stars that gave birth to Neal’s ancestors. It was as tall as an airship and as wide as the scorched alleyway, but it lowered its great head to the ground to stare at them with one golden eye. Neal closed his eyes and pressed his face to the space between Killian’s shoulder blades, soaking in the heat rising off Killian’s skin. Heat pushed at him from all sides—Killian, the dragons, the scorched air. I’m not human, Neal thought, pushing every memory he had of water and darkness and stars to the front of his mind. “He isn’t human,” Killian said, his voice a rumble along his spine. The dragon stood silent for six heartbeats, Neal held jagged secrets on the tip of his tongue, and Killian tightened his grip to keep him silent. The magic of the rhymes and the rhythm of the city filtered away to the roars of dragons and the screams of humans. “Dragon Son,” the dragon began then stopped with a shake of its great head. “Quell your fire,” Neal whispered. “This has to stop, Niyah,” Killian said, his voice low and hard. Killian turned at a sound somewhere between a scrape and a growl, the burning heavens’ light catching the reddish scales along his neck. Neal touched them with first a fingertip, then with his lips. “Yes,” Neal whispered against the heat of Killian’s dragon scales. under his feet and, for nine heartbeats, Neal knew what it was like to fly. When Neal was six, he discovered his mama was a mermaid. Lana had always loved the ocean. She would stand on the beach with the sand between her toes and stare at the ocean with her storm-tossed eyes. Neal would build sandcastles, happily pushing sand into piles that had crumbled and never obeyed. Never obeyed until Lana had knelt next to him and covered his little brown hands with her larger, darker ones. He’d settle back against the soft roundness of her belly that had carried him and the width of her thighs that always meant safety and watch as she helped him shape the cylinders. She’d tell him stories. Stories of space sirens who swam through the stars. Who carried constellations in their hair and stardust in their bones and suns in their eyes. Who had meteors for teeth and comets for tails and swam from galaxy to galaxy protecting the universe. How the oldest and largest of their kind nestled in dying stars and became supernovas, creating new life and new bones and new constellations. How they wrapped around planets to protect them, the constellations in their tails showing sailors the way home night after night. Even though he’d been too young to understand, it made him sad. He’d twisted around in her lap and burrowed his face between ample breasts that had fed him for years and had blown raspberries on her throat until she’d laughed and twisted her head to the side. And that was when he’d seen the scales. Shimmering silvery discs coating the side of her neck to behind her ear. The silver faded to the same green-blue of her eyes. Neal had touched them with first a fingertip, then with his lips. They were smooth and smelled like salt. He also hadn’t understood what this meant, other than it made his mama sad. “I wanna be a dragon when I grow up,” he’d whispered, his heart pounding up his throat and into his mouth where it threatened to fall out in his mother’s lap. The next day the War of the Sea began with the destruction of an underwater battleship when it rammed the merking’s coral castle. Neal’s father was drafted to fight for the humans against the merfolk. Humans and merfolk forgot their ancestors. Forgot their shared history in the stars. Turned on each other in violence and vengeance. The horizon had glowed with the fires of ships and the luminescence of sea blood as if hell itself had split the earth open with the knife of war. The war lasted four years. His father never returned home, and his mother always kept her scales covered with a red scarf. She’d never spoken of the stars or the water again. Neal dragged his eyes open, the heat searing them the moment it could force its way past the tangle of his eyelashes. His first thought was of his messenger deliveries and how he was surely late. His second thought was of his mother and how the sky reminded him of her red scarf. His third thought was of the large red dragon currently staring at him with deep golden eyes, the pupils wide and concerned. His fourth thought was of horrible, unrelenting pain from his hips to his heart. “Don’t move,” rumbled a voice. In the breadth of a blink, the dragon was no longer a dragon but a boy with fiery hair and golden eyes and crimson scales patterning up his neck and to his cheekbones. As Neal stared, the scales receded off Killian’s face and faded to his neck where they blended back with his hair. Killian rumbled low in his throat as Neal rolled to his side and pushed himself up on one elbow. His back hurt. His hips hurt. His legs stretched out before him, long and dark and heavy and oh so very unfeeling. Blood stuck his shirt to his stomach. He pressed a bruised hand to the darkest of the red across his side and swallowed the pain. He couldn’t feel anything below his hipbones. Airships boomed in the distance. Bodies of machine and beast fell into the ocean, sending up clouds of water and steam which rolled inland in a claustrophobic, sucking fog. Sirens blared and humans shouted as they tried to organize against the assault. But Deme wasn’t soldiers. Deme was the poor and the devout. The rich and the merchants. Instead of swords, they had pamphlets. “What is this?” Neal stared at the city. At the skyline traced with the flames of dragons. A V-formation of black dragons flew overhead, their bodies long and sleek and carrying death to the metal and wooden structures that adorned the ground like gravestones. Killian pushed at Neal’s chin and Neal turned his head, knowing the light would catch the faint scales behind his ears. He’d always kept them hidden, but the ocean ran in his blood, turning it bluer than any amount of money or pedigree ever could. Killian stayed silent. He pressed his lips to Neal’s scales. “You said I could keep you,” Killian said, the growl of his voice betrayed by the desperation in his eyes and the clenching of his fingertips on the side of Neal’s neck. They stared at each other for twenty-one heartbeats. Neal closed his eyes, and Killian became a dragon. When Neal was thirteen, he grew a tail. As far back as he could remember, he’d always known how to swim. Fleeting memories that were more flickering images of light and color than anything tangible showed him water and chubby baby fists. Three years after the War of the Sea, Neal had crept past his mother’s darkened bedroom and out of the house that was little more than four walls of wooden sadness and plaster melancholy. He’d made his way to the ocean, his shadow sliding across buildings and streets like a wraith. He’d refused to believe his father perished. There’d never been a body and his ship had never been found. It was as if the mighty steamship and her hundreds of soldiers disappeared into the fog on the ocean and became ghosts. He’d felt in his thirteen-year-old bones his father was still out there. If Neal could find him . . . If Neal could find him . . . If Neal could find him, maybe his mom would smile again. Cold wind had whipped off the water and curled around his arms, pulling and tugging him toward the darkness. His dragon heart had pounded out the rhythm of his fear even as he’d shed his clothes and pushed against the incoming waves. The water had finally embraced him and pulled him far away from shore and safety, the ground falling away beneath his bare toes into the abyss of the ocean. He’d kicked his feet and sliced his arms through the water, the darkness growing lighter by degrees as his eyes had shifted. His lungs had burned less, and a warmth had stolen through his body until he was no longer kicking with feet but with a long, black, eel-like tail that stretched behind him for an age. It had glowed with streaks of blue as warning he held poison in his sharpened bite, something he’d accidentally discovered last time he swam. Neal had never told his mother about his midnight swims. He’d never told anyone. Telling would mean questions. All he wanted to do was swim in the darkness. He walked the line between two worlds, and those worlds had ripped each other’s hearts out of their bodies, tearing him apart in the process. Neal had paused a mile out from the shore, his tail flicking back and forth in agitation. The water had pushed at his body, holding him together when all he wanted to do was fly apart. The gloom cleared and a face had appeared. Human but not. Silver skin. A black tail that bloomed and billowed behind her body like a royal train. Teeth like knives and a smile that could cut glass. Too-wide eyes glimmered with their own soft, blue light. Too-long fingers had flicked off signs in a language Neal had worked hard to master. Neal had looked away, disappointment punching his heart and squeezing his chest. He was grateful for the ocean pressed to his face. No one would ever see the tears. “You have to find him,” Neal had begged, his signs stumbling and inexpert. “No.” Neal had sliced the sign through the pressure and the water and the heartache. Long fingers had closed around his arm and pulled him back. The mermaid’s tail had floated up almost lazily but surrounded Neal like a cloak. It had twisted and spread and wrapped until the two of them floated in a cocoon lit by the mermaid’s glowing eyes. Neal had bowed his head, shaking it in frustration. His tears had mixed with the sea, and a little more of him was lost to its darkness. “I’m not like you.” Neal had gestured to his brown skin and human hair and sea-colored eyes. Home was a word Neal had no definition for. Home was his mother. Home was his father. Home was the ocean. Home was his burning city. Home was the worn cobbles. Home was Killian, who was more dragon than boy and carried him across the dark water in clawed feet. The dragon’s wings beat the air in a rhythm as old as time itself, syncing with Neal’s heartbeat as he faded in and out of consciousness. The pain crawled through his body, settling deep into his bones. They flew away from the burning city, away from the roars of dragons, away from the screams of the damned, their faded neon graffiti failing to save them. The further out to sea they flew, the more the sky cleared, until the stars glittered above them like scales on a space siren’s tail. The constellations shifted as the great siren who guarded their tiny planet with her illustrious tail unwrapped herself from the ball of destruction as if escaping the chaos below. Night flooded the world, and constellations vanished into the darkness of the cosmos. Neal stared at the darkness, at the billowing void of space that yawned at their world with meteors for teeth and comets for tails and binary suns for eyes. The dragon swooped lower to the ocean, the stillness calling to Neal’s scales even as his heart beat for the beast who saved him. They landed on a small island that was nothing more than an undersea mountain peeking at the world. When the dragon landed, Neal closed his eyes. Neal smiled, raising a hand to find Killian’s face. Killian’s cheek pressed to his palm, his skin heated and smooth even as the scales receded under Neal’s touch. “What happened?” Neal asked as he opened his eyes. Killian gathered Neal in his arms and carried him closer to the water. Silently, he helped Neal pull off his clothes and, for once, Neal wasn’t ashamed to be naked in front of one who could see the scales winding across his flesh like the footprints of another life. The ocean lapped at Neal’s dead and broken human legs, probing and pushing and exploring and soothing. Neal leaned against Killian’s chest, his lower half in the darkness of the ocean. The salt stung his wounds but, for the moment, he was grateful he could still feel them. Could still feel Killian’s overheated skin. “And we were born,” Neal said. “What happened next?” Neal asked. His mother never told him this part of the story. Tingles ran down his hips as injury knitted along his spine. His tail flicked once. “But I saw you,” Neal said. “Why?” Neal said in a soft voice barely heard over the splash of the waves on the rocks. “Because I fell in love with you.” Killian said, his voice hitched as if an ending neither of them wanted approached with the force of a comet. “Dragon Son,” Neal whispered as he turned his face to Killian’s. “Siren Son,” Killian replied, his voice merely a warm breath before their lips met. The dragons roared, and the world cried out for relief as the sirens reached down out of the heavens to stir up the storms and soothe the scorched skin of the planet’s surface. The rain pattered the rocks, streaking them like tears. It played across the ocean and their bodies. In the growing darkness, three merfolk broke the surface, their large eyes trained on Neal. “I can’t lose you to the darkness,” Killian said against Neal’s lips. “We will,” a mermaid said in a rasping voice, hoarse from disuse. “But he belongs with us,” said a second. Two of the merfolk hissed, baring needle teeth. The third stared at Neal for twelve heartbeats. Neal stared back. “You will die if you stay on land. Your human body is broken,” the mermaid rasped. The merman tilted his head, something resembling a smile ghosting over its pallid features. Neal shuddered, swallowing the scream. Swallowing the pain. Swallowing the anguish of what this deal would mean. No more legs. No more land. Forever in the darkness and silence of the ocean. He leaned fully into Killian’s arms, his strength leeching into the rocks. “I have to go,” Neal managed. He tasted metal on his tongue, and all he wanted to do was sleep. Neal slid into the water, and Killian’s hands slid off Neal’s body. The merfolk embraced the boy with the ocean eyes and made him whole as he returned to the darkness and silence that was his home. The dragon howled at the sky, his golden eyes flashing, and beat his wings against the heat as he took flight to stop his brethren from killing the world. While the history texts chronicled official accounts of the War of the Sea, the Awakening, and the Reconstruction, legends and myths live longer than schoolbooks made of paper and old men’s thoughts. As humans reclaimed the earth and waited for the sky to cool, they told the story of the Dragon Son, who stopped the dragons because his heart was broken and he could bear no more death. They told the story of the Siren Son, who returned home and rallied his people to put away the vestiges of their hatred in order to save the world. The story became myth and myth became legend. In some stories, it was a sparrow and a perch. In others, it was a snake and a shark. But most remembered and passed those memories through generations. The history texts would never write of the boy named Neal or the boy named Killian, but the people forever spoke of the Siren Son with the dragon heart who fell in love with the Dragon Son and, together, stopped the death of the world. And sometimes, on a clear night under the glittering constellations of the Siren’s tail, you might see a fleeting shadow cross the moon as the Dragon Son flies over the darkness of the ocean in search of the Siren Son. When they find each other—as mothers tell their children at bedtime—the world is calm but for a moment. Tristina Wright is a blue-haired bisexual with anxiety and opinions. She’s also possibly a mermaid, but no one can get confirmation. 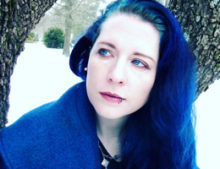 She writes YA SFF novels and short stories with queer teens who become heroes and monsters. She enjoys stories with monsters and kissing and monsters kissing. She married a nerd who can build her new computers and make the sun shine with his smile. Most days, she can be found drinking coffee from her favorite chipped mug and making up stories for her two wombfruit, who keep her life hectic and unpredictable. 27 Hours will be her debut novel in Fall 2017. Meanwhile, you can find her guest posts and short stories scattered around the internet via tristinawright.com.